Sometimes the appetite of journalists for the trivial - or the appetite that journalists think the public have for the trivial - is breath-taking. This morning, considerable air time was devoted on radio to Jeremy Corbyn’s failure to sing the British national anthem at a service to mark the 75th anniversary of the Battle of Britain.. This was seen as disrespectful. My own view would be that since Corbyn is a republican, it would have been hypocritical to sing the words of God Save The Queen, so maybe better disrespect than hypocrisy. But let’s pull back a bit and ask: what would have changed if Corbyn had sung God Save The Queen? Nothing, really. You could be a spy committed to the downfall of the monarchy and global capitalism and sing the anthem, and it wouldn’t make a whit of difference. Some of the biggest eejits (hello John Redwood) have ploughed into national anthems and remained appalling eejits when they emerged at the other end. You may approve or disapprove of Jeremy Corbyn, in which case you should be focusing on the policies he advocates and the worth they have. Two days ago we saw something similar, when Gerry Adams was interviewed on RTE by Claire Byrne. In the course of the interview she battened onto the question “Why do you keep saying you weren’t in the IRA?”. Adams, you’ll almost certainly recall, has always maintained he was not a member of the IRA but that he was an unambiguous supporter of the IRA. Yet Claire Byrne thought it important to go over this well-trod ground yet again. Why? 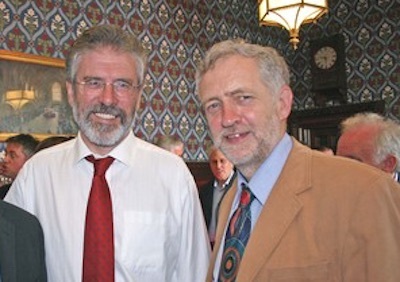 As with Corbyn’s anthem, what difference would it make if Gerry Adams were to say “Yes, I was in the IRA”? Would his critics then say: “Ah, at last we have an honest man leading Sinn Fein!” Or would they then move on to criticise other matters such as his beard or his teeth? You’ll often hear people say “But of course he was in the IRA. If he lies to us about this, we clearly can’t trust a word out of his mouth”. In which case, maybe someone should ask the interrogators if they have ever told a lie. If they answer truthfully that they have - everyone at some point has told a lie about something - then we could say “In that case, we can’t trust a word out of your mouth, go home, give up your media interrogator job and become a mime artist”. The truth is that criticism of Corbyn’s non-singing of the British national anthem, or the clothes he wears, or his beard, are obviously superficial to the brink of ludicrous. Journalists shouldn’t be wasting time talking about them, and they know it. Likewise with Gerry Adams’s being in or not in the IRA - it’s a colourful distraction from real and important matters such as the collapse of Stormont and the inaction of the Taoiseach Enda Kenny and the British Prime Minister David Cameron over a key aspect of an international treaty of which they are the co-guarantors. Jeremy Corbyn’s non-singing of the anthem or Gerry Adams’s membership or non-membership of the IRA have all the journalistic importance of “Freddie Starr Ate My Hamster”.